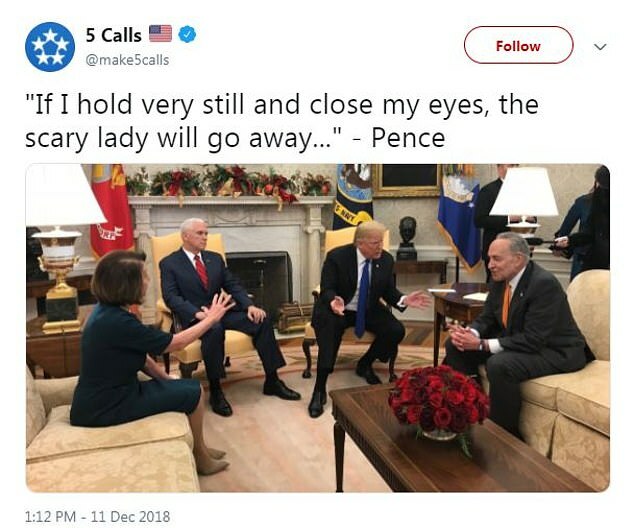 Tensions rose and anger boiled in the Oval Office where Donald Trump verbally boxed out with Nancy Pelosi and Chuck Schumer on Monday, but Mike Pence didn't seem to notice as he sat cool and silent in the corner and appeared to catch up on some shut-eye. 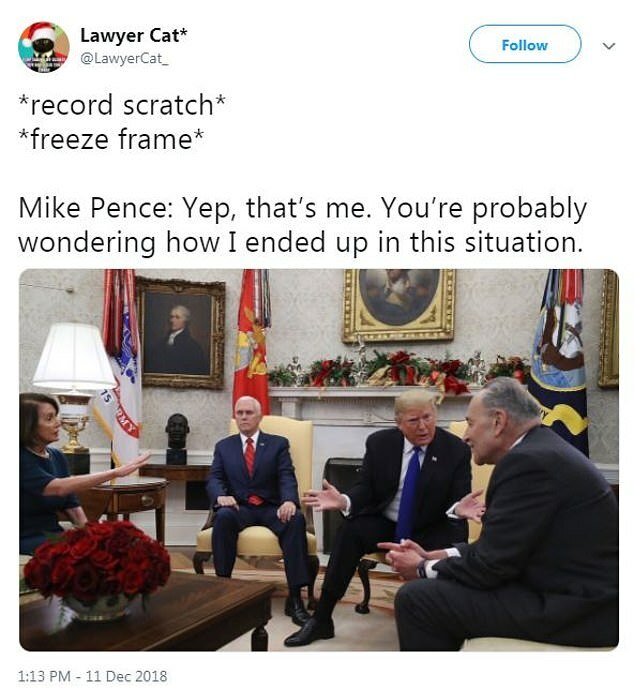 Twitter users had a field day making fun of the Vice President's very awkward and catatonic behavior where he remained tight-lipped, stared at the floor, and briefly closed his eyes during the heated confrontation. 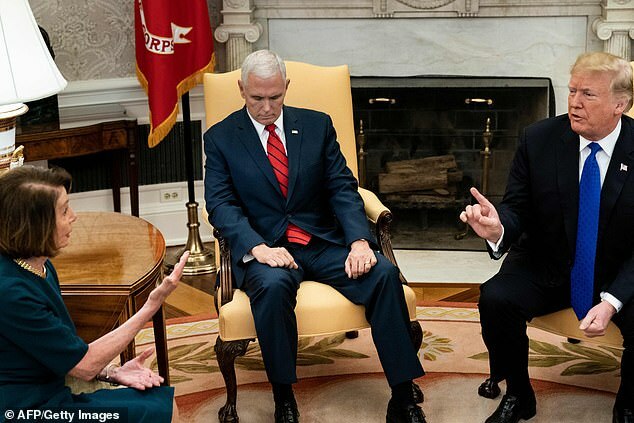 'How Mike Pence could fall asleep during the heated meeting with Trump, Pelosi and Schumer is beyond me. No stamina!!' Chairman of the Democratic Coalition Jon Cooper tweeted. 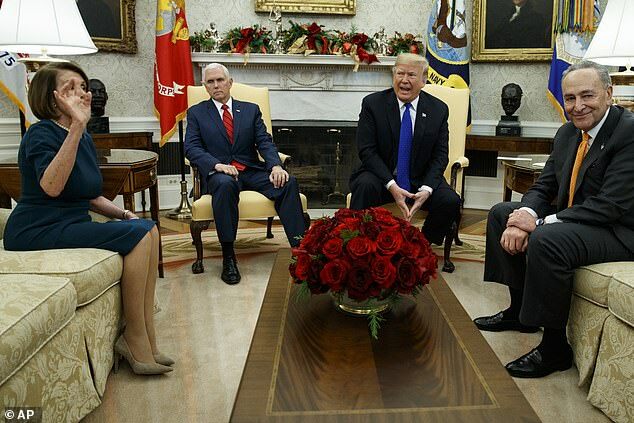 'VP Pence is me at every family dinner,' Twitter user Steven Buccini joked. 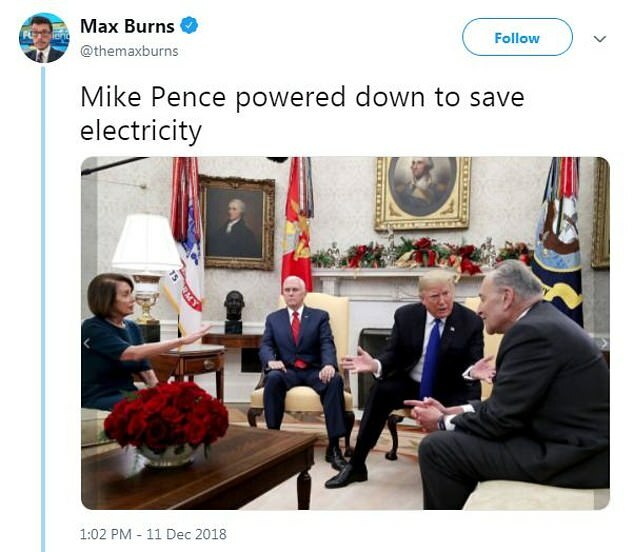 'Mike Pence powered down to save electricity,' one Twitter user said on Pence's shut-eye. 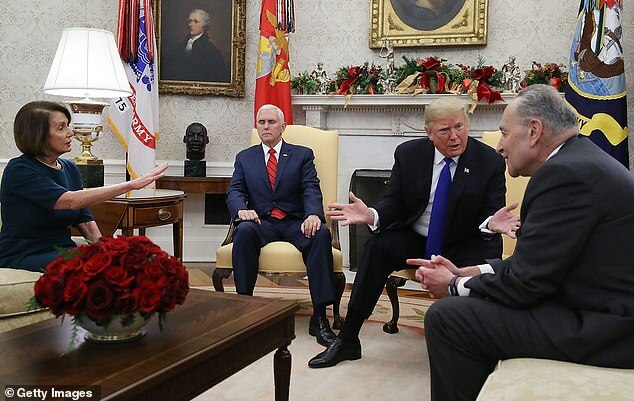 Even when he was awake, Pence was noticeably silent and bored in the discussion. 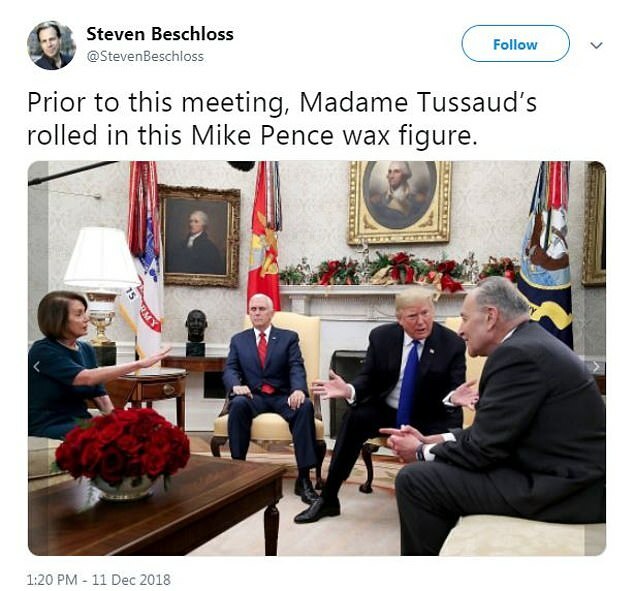 'Funny how Pence was in that meeting, but you wouldn't notice. He was like an embarrassed little kid dressed as a Christmas tree, in a 2nd grade holiday play, with no lines,' a Twitter user said. 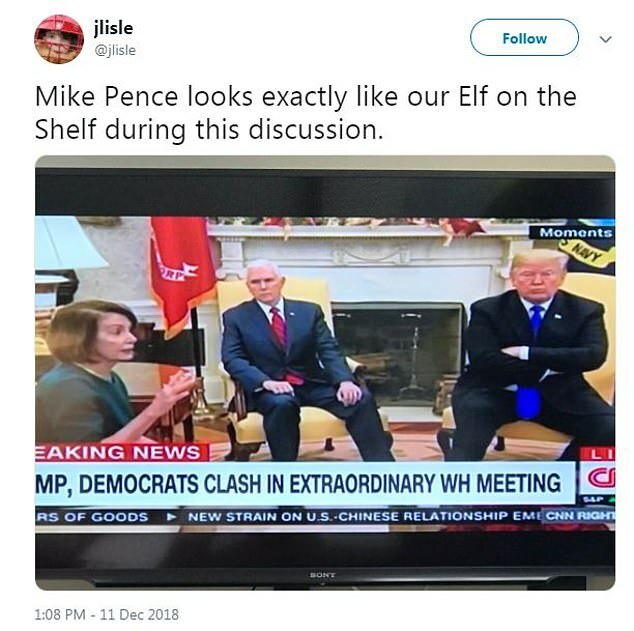 'Mike Pence looks exactly like our Elf on the Shelf during this discussion,' one Twitter user said. 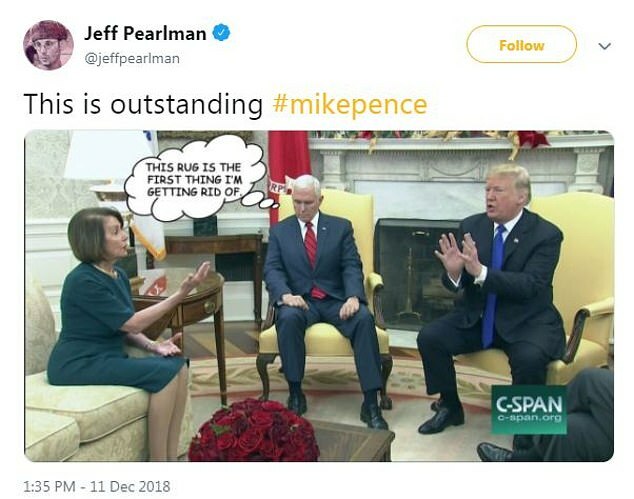 Another Twitter user made Pence into a comic giving a thought bubble saying 'This rug is the first thing I'm getting rid of' as he stares at the ground, contemplating Trump's impeachment. 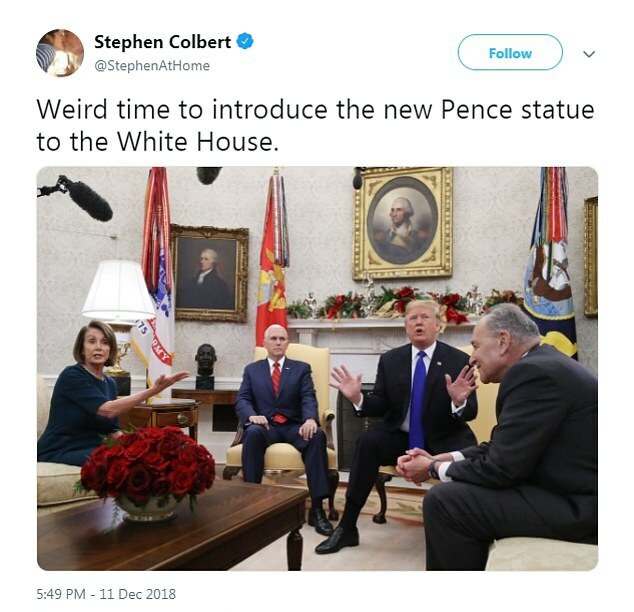 Others joked that he was praying to be taken away from the heated argument over the government shut down and border security. 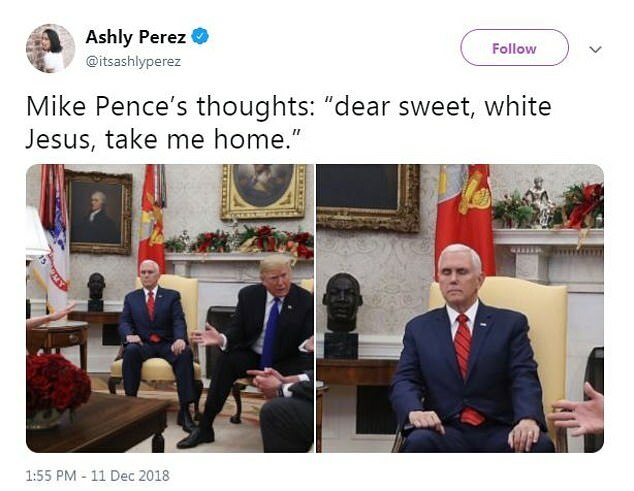 'Mike Pence's thoughts: "Dear sweet, white Jesus, take me home,"' on Twitter user wrote. 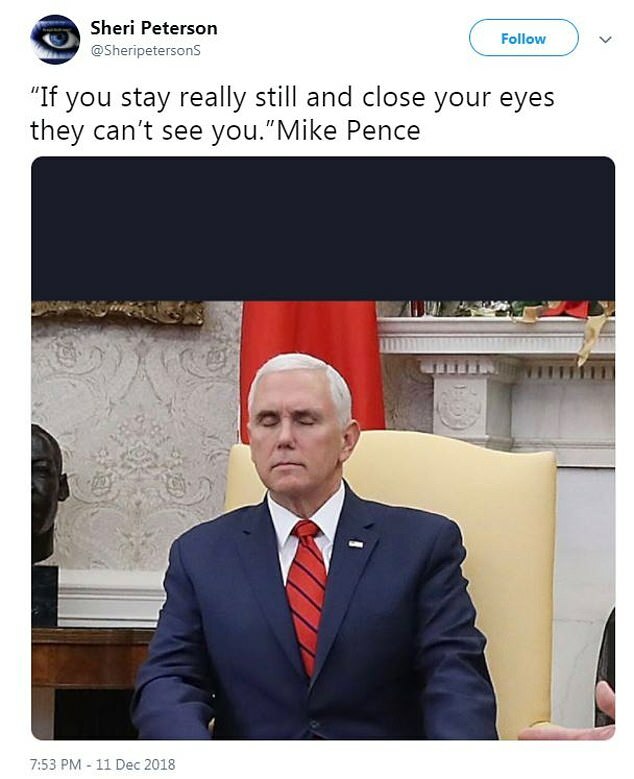 '"If you stay really still and close your eyes they can't see you." 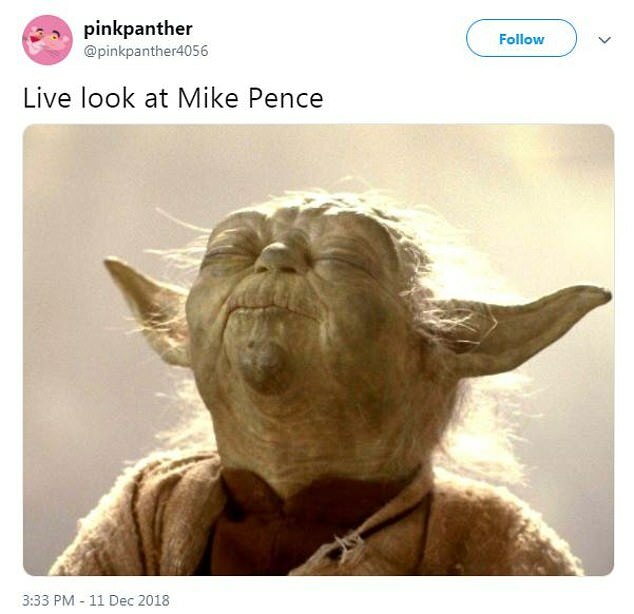 Mike Pence,' another Twitter user wrote. 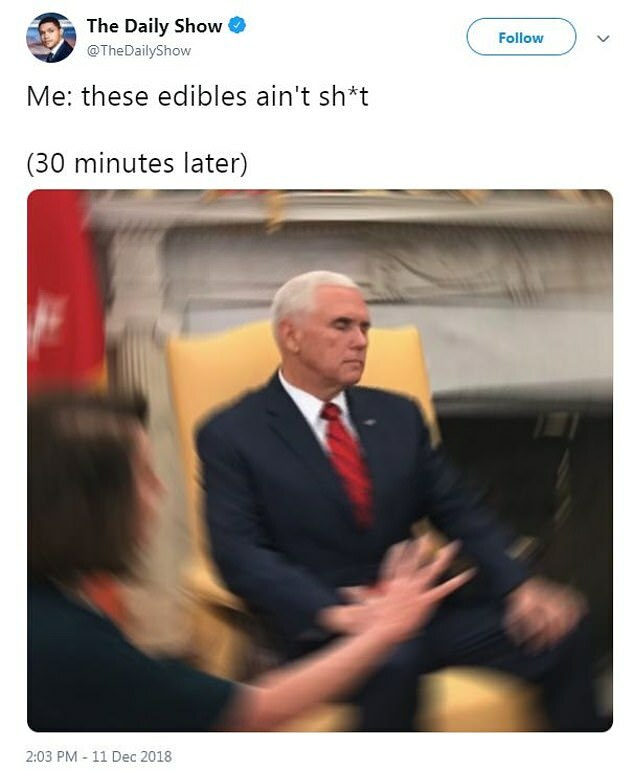 The Daily Show joked that Pence wasn't sleeping, he was simply stoned, sharing a picture of Pence in a high haze. 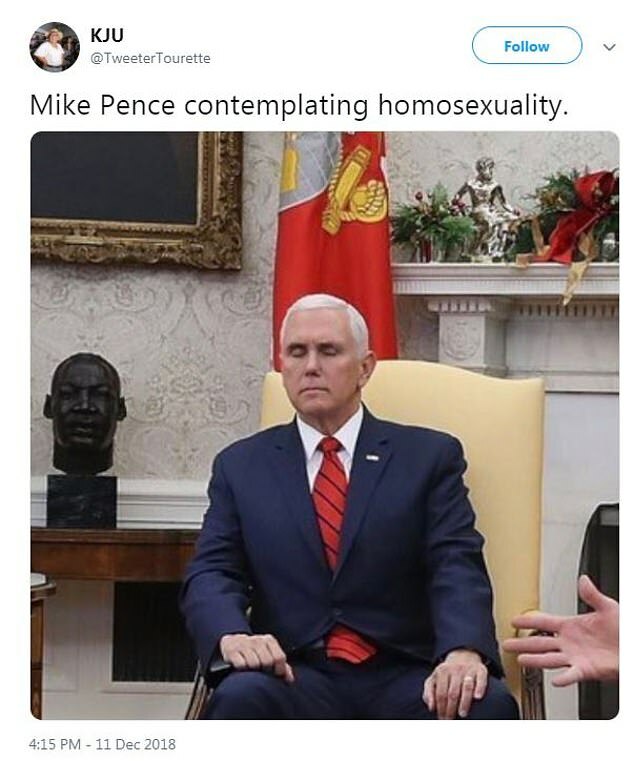 Others captioned the photo 'Pence contemplating homosexuality', poking fun at the Vice President's opposition to gay marriage. Some joked that he looked blissfully at peace like Yoda of Star Wars as he closed his eyes during the argument. Others compared his still and silent nature to a Madame Tussaud's wax figure. 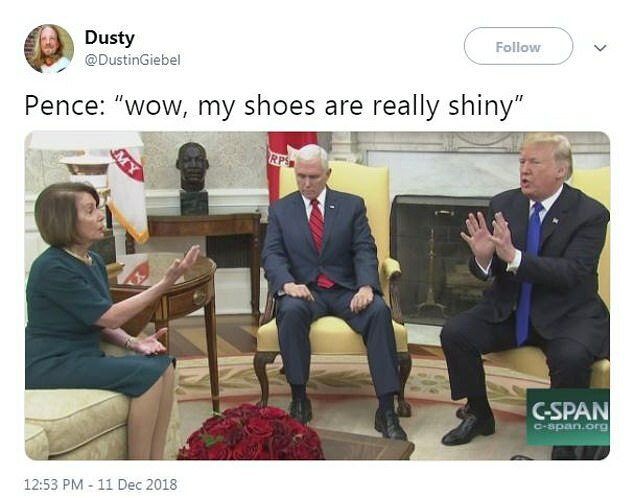 'Why did they even put Pence in that room? He might as well be a houseplant,' one Twitter user noted. Some social media users found his stiff silence in the corner all too familiar, joking that it felt like being in a friend's house while they start arguing with their parents. 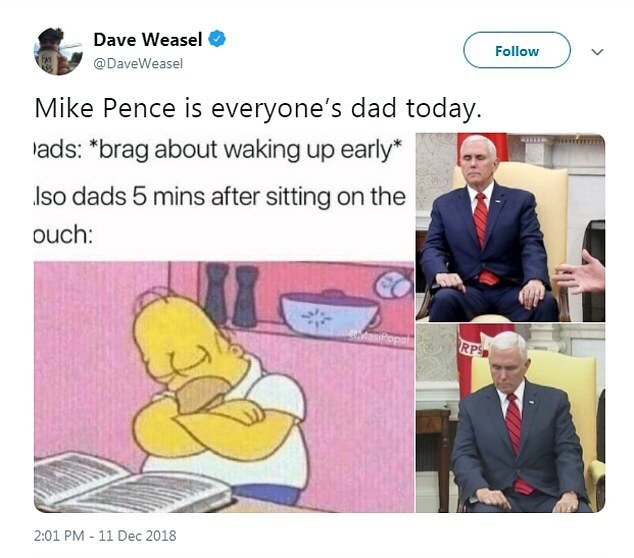 Some joked that he was a typical dad, falling asleep within five minutes of a conversation. So sad to our government and country being destroyed every day. And the people just sit and watch.